Some of most ‘beautiful villages of France’ plus beaux villages de France’ are found in the Vaucluse region of Provence. 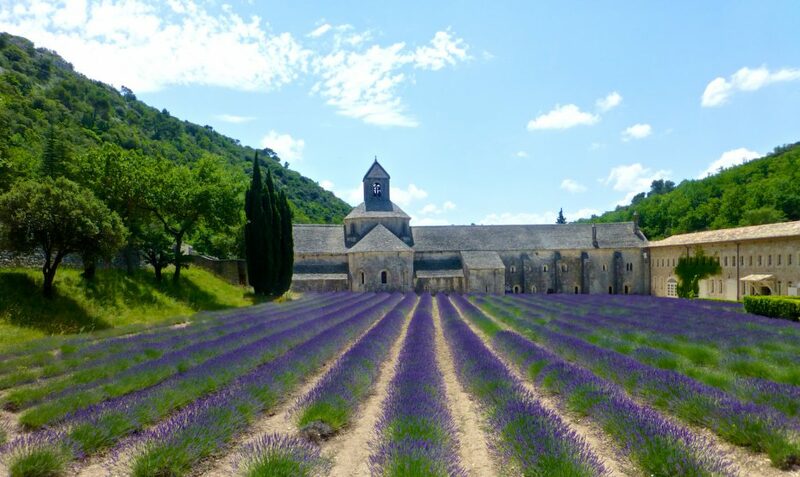 Of the seven Vaucluse villages classified as ‘plus beaux villages de France’, five are in the Luberon Valley; Lourmarin and four villages perchés (hilltop villages); Ansouis, Menerbes, Gordes and Roussillon. 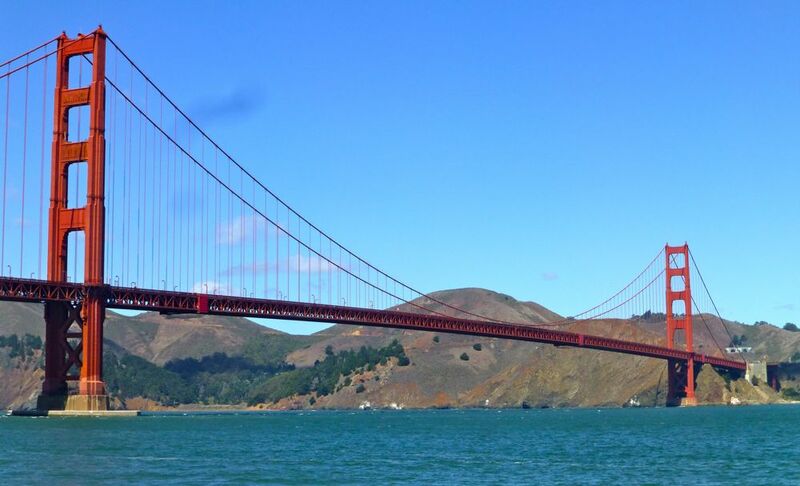 Mostly dating from the Middle Ages and usually clustered around a château they are perched high above the region’s sweeping vineyards and orchards they define this breathtaking region. Golden stone walls weathered by time, tall, shaded, narrow streets, occasionally splashed with sunlight as the sun momentarily casts its rays to peep around the corners as the day unfolds. Radiating their own unique charm and all within a few miles of one another, one cannot be failed to be captivated. Ansouis is the first of the ‘beautiful villages of France’ we are going to visit. A meandering collection of winding, cobbled streets and brightly coloured shutters. 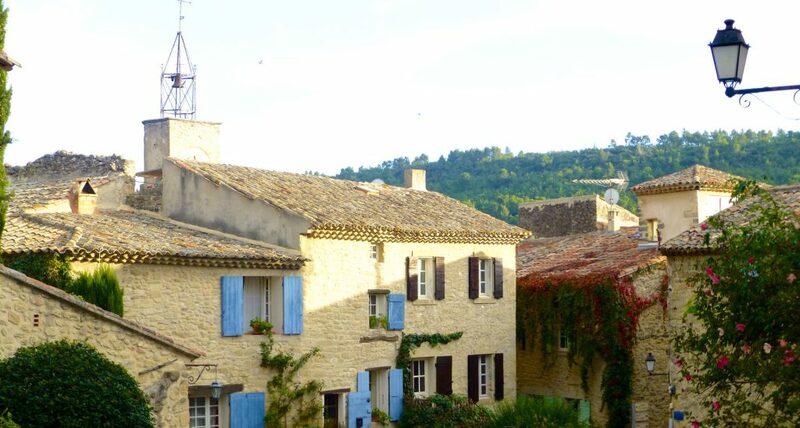 Lying in the southern Luberon, it is just 15 minutes (6.5 miles) from Lourmarin, tiny but captivating!! Don’t miss a peek into its incredibly well preserved chateau which dates back to 961 to admire its incredible collection of 17th and 18th century furniture and tapestries and the neighbouring pretty little church St Martin. Ansouis has an excellent restaurant La Closerie (Boulevard des Platanes, 84240 Ansouis Tel: +33 (0)4 90 09 90 54 ) charming and elegant with delicious food but make you sure you book! There is also a slightly bizarre little museum, Musée Extraordinaire set in a recreated underwater grotto housing the collection of one man’s diving finds, it is open most afternoons! You will find the delightful, fortified village of Ménerbes on the other side of the valley from Lourmarin (14 miles away) just beyond Bonnieux. Ménerbes has been home to many artists and writers. Picasso lived within its enfold and Peter Mayle wrote his best seller ‘A Year in Provence’ here. Ménerbes has several beautiful renaissance properties and in the town hall square, Place de l’Horloge, you’ll find a 17th century belfry and the lovingly restored ‘Maison de la truffe et du vin‘ where you can sample local truffles and wines. There are several places to eat. 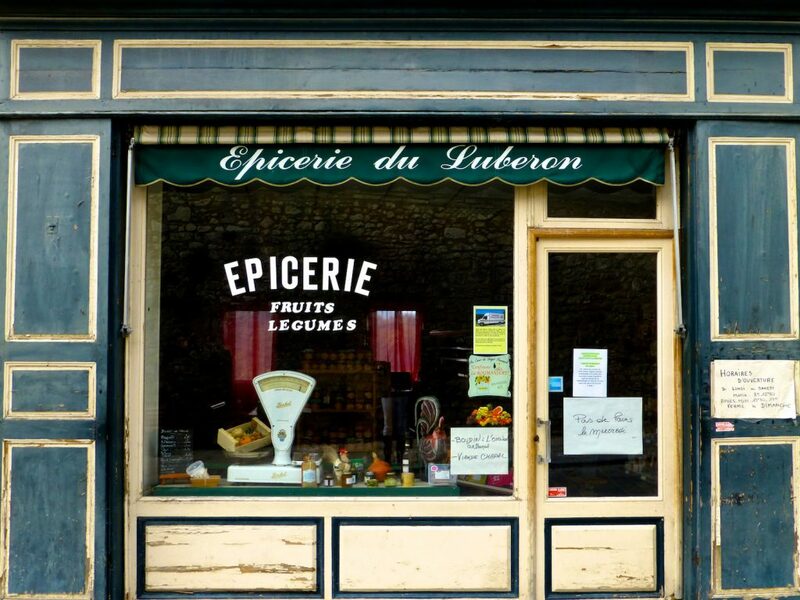 Market day is Thursday and there is a really good lavishly stocked épicerie open most days! 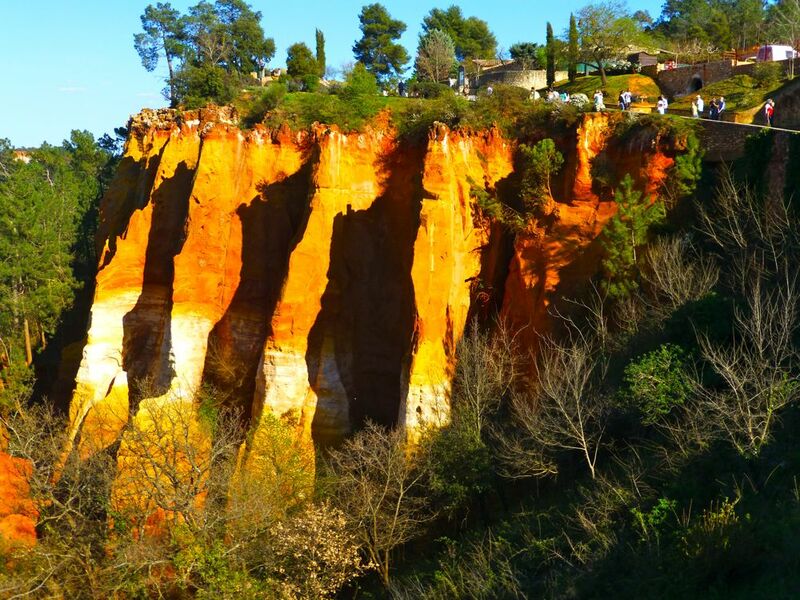 You can sample wonderful local Luberon vintages at the nearby domains. The wonderful Domaine de Marie and on your way on to Gordes, Domaine de la Citadelle, home to the Corkscrew museum, a fascinating, collection of over 1,000 corkscrews showcasing the history of the corkscrew. 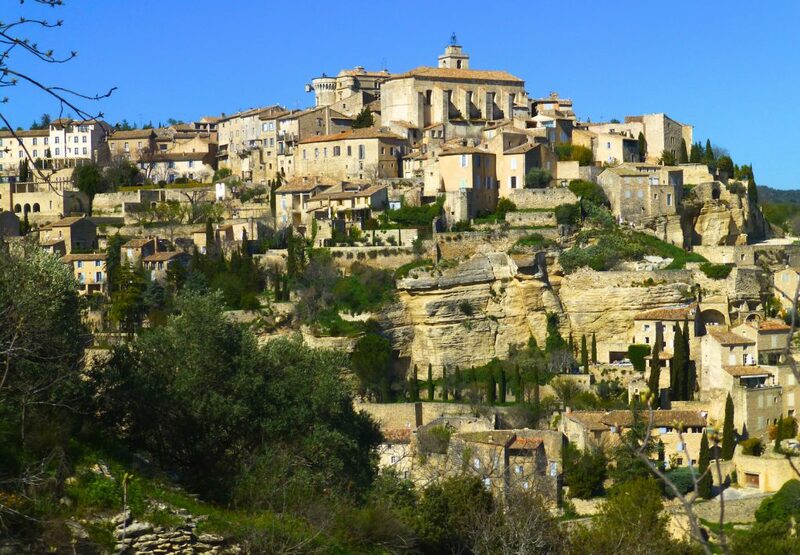 Gordes, is our next ‘beautiful villages of France’ and is another 7 miles further, on the opposite side of the valley floor. Following the olive tree flanked hairpins, the road will begin to straighten and as you turn one of the last corners you will suddenly be greeted by a breathtakingly spectacular view. It almost looks as if someone has collected a cluster of stone buildings, grabbed them in their hand and scattered them to tumble dramatically down the hillside…. 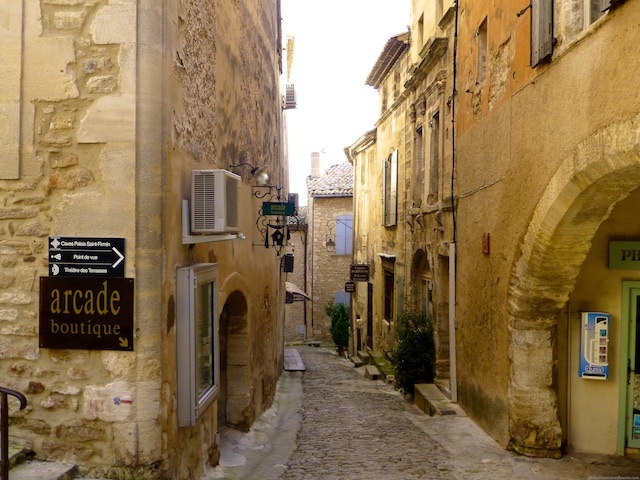 A peek along the streets through Gordes’ honey stone buildings. The ancient doorways and carefully restored stone-faced buildings preserve the stories of centuries of history. On your way to the next of the ‘beautiful villages of France’ Roussillon, don’t miss L’ Abbaye Notre-Dame Sénanque, a Cistercian Monastery nestled at the foot of the hills below Gordes. It looks at its most splendid when the surrounding lavender fields are in full bloom, around late June each year. At this time of year, in early spring. 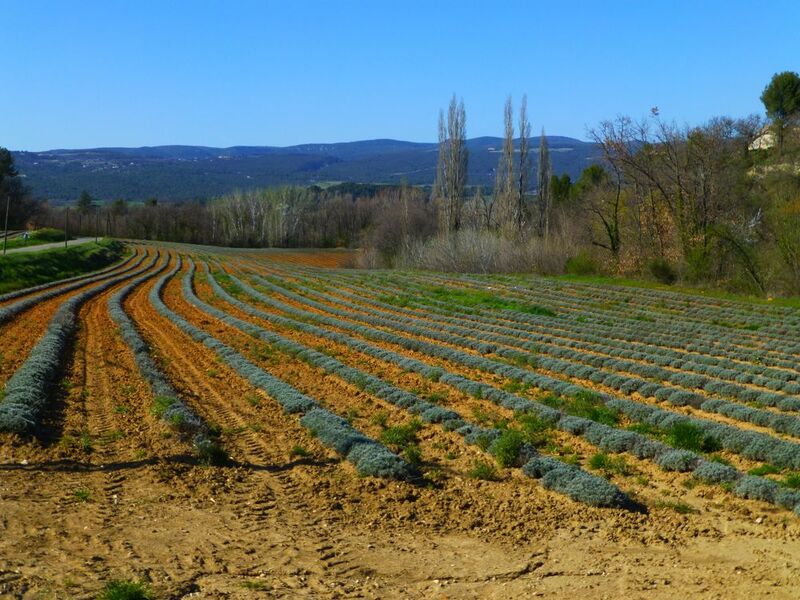 the lavender fields look more like rows of fat little hedgehogs, you’ll pass many of them on your approach to Roussillon. 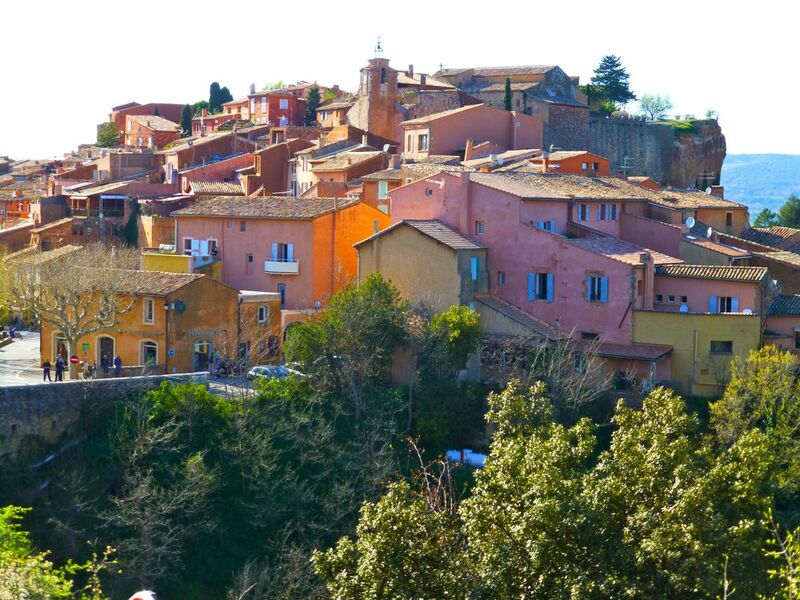 Roussillon, the fifth of our ‘beautiful villages of France’, is famous for its vibrant blood orange colours ~ the natural pigment of the surrounding rock, the rich, vibrant ochre. 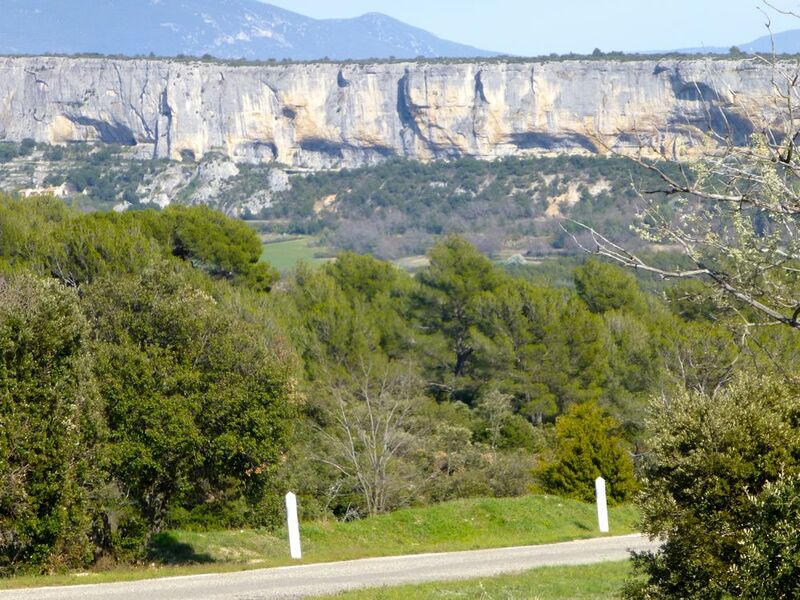 Driving back towards Lourmarin, you’ll be spoiled by the incredible views before winding your way back through Bonnieux and down to the southern side of the Valley where Lourmarin will lay waiting for you. In addition to the Luberon’s ‘beautiful villages of France’ (plus beaux villages de France’), there other many delightful villages to discover. Click to watch the video tour of the region and read about Bonnieux, Lacoste, Oppede-le-Vieux and Fontaine de Vaucluse here, so many others yet to explore!! & the surrounding Luberon area of Provence. do let me what you discover !